Jared Abbrederis was undecided on the Bible verse to use for the upcoming high school state football game (2008). 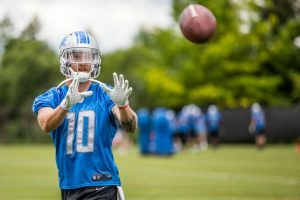 He was thinking of going to his “go to” verse and the one he writes under his signature now as a professional football wide receiver for the Detroit Lions. Jared graduated from Wautoma High School in 2009 with a load of athletic awards and recognition. He was a three-time letter winner in football as a quarterback and defensive back. He was recognized his senior year as first-team all-conference as a quarterback and defensive back, conference offensive player of the year, and Wisconsin Football Coaches Association first-team all-state quarterback. His exploits in track were just as impressive, being a two-time state champion and record holder of the 110 m hurdles and state champion in the 300 m hurdles as a senior. Jared was BFS Male National Athlete of the Year and Gatorade track athlete of the year as a senior. He also participated in wrestling. The second semester Jared decided to reach out. He began to participate in college age ministries through Blackhawk Church in Middleton. He also got involved in the Fellowship of Christian Athletes (FCA), Athletes in Action (AIA), and Campus Crusade for Christ (CRU). He was going somewhere almost every night. This participation was the beginning that brought new life to his walk with the Lord. One evening Jared attended a Life Group, similar to a Bible study, with his friend, Ethan Armstrong. That night turned out to be a special night. “One night at Life Group I met a lady that grabbed my interest. The first night at Life Group you go around introducing yourself and sharing a little of your story and how you got to where you are. I remember this lady (Rachel Otto) saying she had figured out how she would come to Madison to find a job. She said she prayed about it and felt Madison is where God wanted her to be. I was impressed!” On the way to campus, Jared told Ethan he was going to marry Rachel. Two years later, May 26, 2012, Jared and Rachel were married. They have been blessed with a 2 ½-year-old daughter, Kenzie, and they are now expecting their second child. They make Wautoma their off-season home, for now, and they worship at Waushara Community Church. Jared’s accomplishments for the Badgers is incredible considering he was a walk-on. As a senior, he won the Burlsworth Trophy, which recognizes an accomplished player who began his college career as a walk on. Jared’s accomplishments for the Badgers is incredible considering he was a walk-on. As a senior, he won the Burlsworth Trophy, which recognizes an accomplished player who began his college career as a walk on. He finished his Badger career tied for the Badgers all time reception record of 202 receptions. He also has the single-season most receptions at 78, the highest average per kickoff return for career at 25.8 yards, and the most kickoff return yards in a game with 201 yards versus Oregon on January 2, 2012. Abbrederis graduated from UW-Madison in 2014 with a bachelor of science degree in the school of human ecology and family studies. He was drafted in the fifth round (176th overall) by the Green Bay Packers. Jared was excited to be drafted by the NFL team he supported growing up. His first season was ruined by an injury that cost him the whole season. The 2015 season was an “on again, off again” year, but he did have some quality games. The 2016 season was cut short because of injuries, and the Packers and Jared mutually parted ways. During this off-season with his injuries healed and feeling healthy, Jared signed with the Detroit Lions. Jared felt being drafted was a huge accomplishment because one needs to consider the number of guys trying to get drafted with so few positions available. Jared considered a highlight as a professional when the Packers played Arizona in a playoff game where he played a ton of snaps and felt he contributed to the team. He comments, “I finally played consecutive snaps consistently during the game where I felt I contributed to the team. It was fun, and it reminded me of times in college where I was in most every snap and consistently contributed to the team.” Jared had six receptions for 69 yards (11.5 yards average) for that game. “Jared’s faith and relationship with Christ is evident in all aspects of his life and continues to motivate and inspire me along with others around him. Next post: How Can We Receive The Peace Of God?